After leaving Knitting Camp on Sunday 26 April, I drove down to Jervis Bay for some long-overdue alone time, stopping at the Sourdough Bakery in Berry, which my Sydney knitting pals highly recommended (and with good cause!). 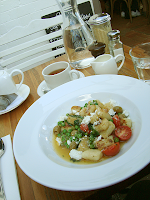 This was my lunch (homemade gnocchi, peas, feta cheese, tomatoes, basil, yum yum). 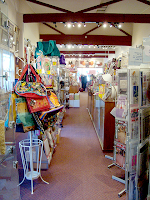 Sew and Tell (133 Queen St, Berry) was the other must-see attraction in Berry - a delightful store packed with embroidery, beading, and knitting books, supplies, kits, and - oh - the yarn! Shelves and shelves of Noro, Sublime, and - the big draw card - Cascade 220 (not available in Canberra at all) - as well as tons of other yarns. I bought enough dark brown Cascade to make a ribbed cardigan. After a reasonable run down the Princes Highway, through Nowra, I reached my destination : the Huskisson Bed & Breakfast. I met my delightful hosts, Kate and Steve, and their pets - Sundae the chocolate labrador, and cats Quokka and Chester. 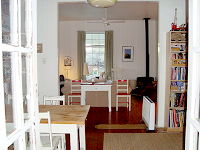 There is a common area with a dining room, little fridge, microwave, kettle and so on, and living room with wood fire, and a ton of books and other treasures. I was the only guest in residence, so it was all mine! The weather was pretty wild - Sunday night had gale force winds - and that was the night I chose to walk to the local Indian restaurant! The food was great, even if the weather was scary. More of Hyams Beach, which supposedly has the whitest sand in the world, although I don't quite know how you could be sure! 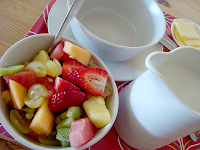 Breakfasts at the B&B consisted of a bowl of really delicious seasonal fruits, with a pot of tea, and thick slices of toast, with locally made jams. 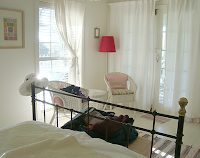 If you ever have the chance to stay at the Huskisson B&B, take it. It's utterly wonderful, even in cold weather - curled up on the cushy sofas in front of a crackling fire was just what I needed. 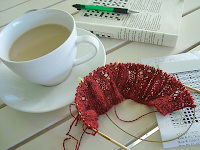 Knitting, reading, and not a lot else. On one morning it was warm enough to sit out on the front verandah with my favourite things : cryptic crosswords, knitting, and tea. 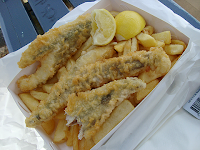 On Tuesday I headed over to Vincentia (the next little town down from Husky) for the fish & chips at JB Seafoods. Flathead. Nom nom nom. Even better when eaten by the seaside! This is the Moona Moona Creek estuary - the most beautiful little spot. 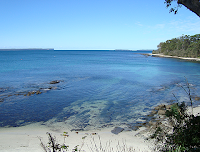 Huskisson was delightful, I really loved it. 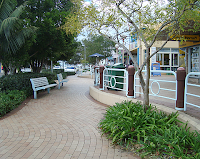 The main street is very attractive. I had lunches at a variety of cafés, all excellent - Main Deck, Locavore, and the Husky Bakery and Café. Dinners were at the local Indian (very good), Thai (excellent), and Italian (so-so) restaurants. 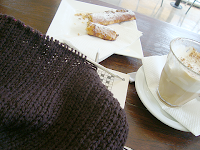 More knitting, this time with Chai Latte and a Banana & Macademia Pastry, at Main Deck. The project is my Cascade ribbed cardy. Kate, Steve and I became friends over these few days. Kate is my age (born 7 months before me), used to be a violinist too, and we have many other things in common! They are professional filmmakers; Kate has quite a few documentaries to her name (for the BBC etc), and Steve is a cameraman. Lulu had to get in on the act, of course - I caught her trying to lead Kate's Camembert astray, but hopefully I got her away fast enough! All too soon, it was time to come home. 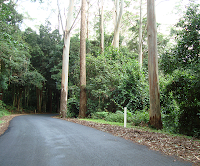 I took the scenic route, from Berry across the mountains to Kangaroo Valley. I saw a whole 3 cars and 1 motobike on the crossing. One of the benefits of travelling midweek! I stopped for lunch at Fitzroy Falls - it's only a short walk to the lookout. I'm really not good with heights; it took more bravery than I was expecting to walk out onto the platform and take these pics. I mean, there's only a plank of wood between my feet and a long long drop! 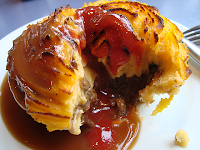 My last holiday meal - a steak and mushroom pie with sweet potato topping, at the Fitzroy Falls café. Just perfect for a chilly damp day. And so I got home on Thursday, after nearly a week away. It was great, and not least because I'm nervous about long drives by myself, in areas I don't know. It was my first ever holiday alone. So I did it, which was no small thing, and everything went well. Now to book my time away for next year! What a fantastic holiday. Peace and quiet and beautiful accommodation and meals and scenery and.... what more could anyone want. oh yes, you must go away again on your own. After a holiday like that, I can imagine you'll look very much forward to doing it again. It all looks so beautiful, restful and happy. Looks fantastic! I've never been to Huskisson but must go!! 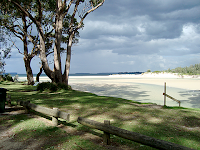 Huskisson is the loveliest of holiday destinations ... the sands you see on my blog are from those very same beaches. mmmm Husky bakery - we've had many a breakfast and lunch there with the kids and JBs sea foods are not bad either ... as you say - nom nom nom. You do deserve another holiday like that - hope it's soon! There's nothing quite like having a whole place to yourself. I can sympathize about taking a picture from such a height - my imagination goes into overdrive, brrr! That post made me feel liberated! The bravery, the solitude, the peace - what a lovely few days. I mentioned before we were only 20 minutes or so down the road, but our family group was more of the noisy, shrieking, fire-lighting and communal barbequeing variety. With added fishing. Just what the doctor ordered! Are you feeling re-energized and ready to jump back into the swim, or still longing for those quiet afternoons by the fire? I hope you were treated like a queen! Wow, what an excellent break. You know, I'm very comfortable doing things by myself, driving, taking holidays etc etc but the one thing I won't do is eat in a restaurant by myself - to me that is the bravest thing you did! Stunning pics and it sounds like a wonderful time away. 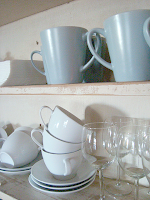 I love that you photograph your food--I want to do that when I take a trip now, to remember the tasty parts. Oh, and you really do have to watch that Lulu, don't you? Naughty girl. gosh that looks like the best holiday ever! so pleased you had such a great time. Looks like bliss!! If I can't go back to Arizona soon, then I want to go to Huskisson. Looks amazing. I long for such a holiday! I will just bookmark your post instead! Wow - now that's what I call a really fabulous vacation - all to yourself! What gorgeous scenery, delicious looking food and wonderful ways to keep yourself "in the pleasure zone" and enjoying your alone time. 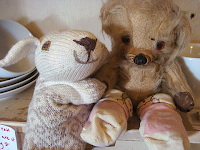 It was good to come along via your photos - thanks for sharing. I need a getaway like that! What a wonderful trip. You certainly deserved it. in fact... 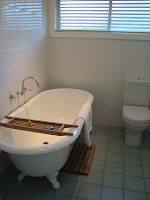 I've just pored over their site..the palce looks gorgeous..lots of natural light. I ownder if they would take a grumpy old mongrel dog like mine.. Sounds like a wonderful holiday.... and SO DESERVED. 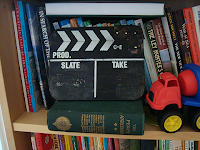 I've enjoyed reading about it, too - thanks for sharing! So fun to read about all these new places! I just love it.